The hotel will definitely appeal to business travelers and families with not much baggage. The staff was warm and happy to serve. Rooms were very well maintained and the location made it easy to do many things. AM staff was very nice, free breakfast was great and the kitchen was a nice touch. The design of the hotel was confusing at times with different levels for the same floor at different entries. Also no help with baggage. This was an excellent hotel for the price. Very well equipped and very comfortable. Not over-the-top plush but extremely nice for a family. Staff was very accommodating. Breakfast was a full meal, not just donuts and coffee. Pool area had a very nice patio complete with BBQ grill. We will make this our base whenever we come to San Diego. Fully equipped kitchen, complete with dishes and popcorn! 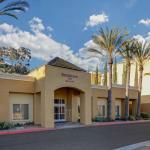 The 142 all-suites Residence Inn by Marriott San Diego Mission Valley is a pet-friendly hotel catering for families on vacation but with good facilities for the business traveler. Some of the two-bedroom suites at this non-smoking, four-story inn have specially designed kids suites, which have bunk beds and an activity table. Items included with the room rate are an extensive breakfast buffet, high-speed Internet access, local telephone calls, a managers evening reception and hot drinks available in the lobby 24/7. The inn has one meeting room for social or business functions that can accommodate 60 guests. Nearby attractions include the San Diego Wild Animal Park, Sea World Adventure Park, Balboa Park, Belmont Theme Park on Mission Bay Beach, Qualcomm Stadium and San Diego Zoo. All the suites have a fully equipped kitchen with microwave oven, stove, refrigerator with icemaker, dishwasher, coffeemaker and a full set of cutlery and crockery. There is a work desk with high-speed Internet access, two-line telephone with voicemail and speakerphone, pullout sofa bed, 27-inch television with cable movie and news channels, pay-per-view movies, hairdryer, VCR player and iron and ironing board. VCR movies are available for rent. The inn has an outdoor heated pool, whirlpool and 24-hour fitness center. The complimentary breakfast is the only meal served here but there are several places to eat within a short drive. They include The Cheesecake Factory, PF Changs, Gordon Biersch, and Mimis Café. There is a full service business center on-site and the 24-hour front desk has safe deposit boxes. Other amenities include a coin-operated laundry, an ATM, a grocery shopping service, games room and a picnic area with a barbecue grill. Families adored this Marriott property. There were lots of attractions a short drive away, there were always drinks and treats in the lobby and the price for the suites was reasonable. Many visitors made use of the kitchen and saved money on dining out. And they used the money they saved to spend extra time here. Most clients said they would use this property again and would recommend it to family and friends. Parking: Yes, there is parking. The cost is $10 per day.